SINGAPORE - It was "chaos" at Ng Teng Fong General Hospital (NTFGH) on Saturday (Nov 4) morning as multiple "casualties" were wheeled into the foyer of Block C.
As the "injured" arrived in ambulances, doctors, nurses and emergency staff members received them and took each one through the decontamination process via a series of showers and scans before giving them treatment. Fortunately, the scene was only an exercise for part of the hospital's full dress rehearsals in the lead up to its first mass casualty incident exercise to be held in the first half of 2018. The exercise was the second of three full dress rehearsals, and will progressively test the hospital's emergency preparedness. The first was held in September this year. 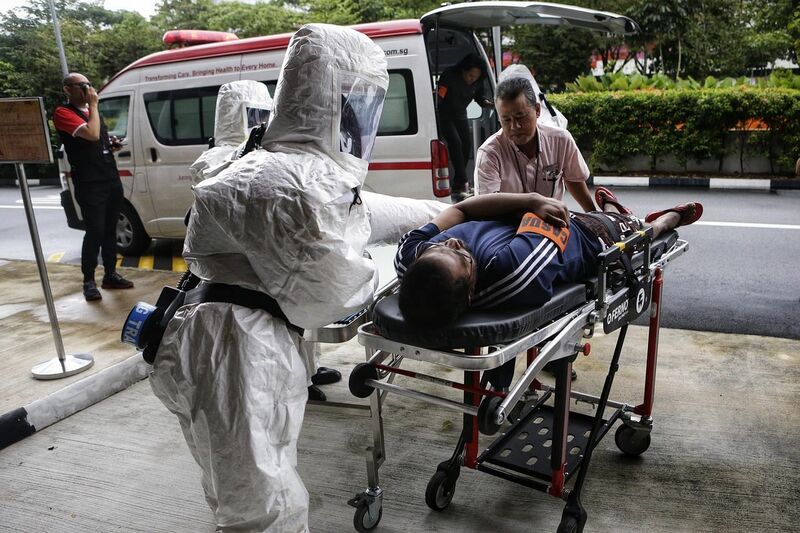 Said Mr Ng Kian Swan, chief operating officer of NTFGH and Jurong Community Hospital: "We need to be operationally ready for any mass casualty incidents, be it a major industrial accident or because of the growing threats of terrorism internationally. "With each exercise, we will continue to build on areas for improvement and shore up our preparedness." 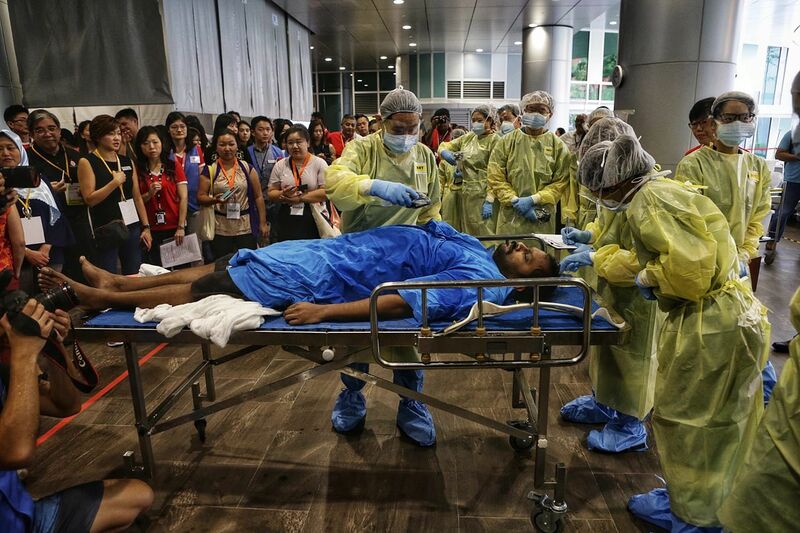 For the first time on Saturday, 35 Community Emergency Response Team (Cert) volunteers from the People's Association (PA) were also involved in the exercise for field exposure to a hospital mass casualty incident. Mass casualty incidents can include major transportation incidents, catastrophic civil disasters, chemical, biological, radiological or nuclear releases or attacks, and major explosions. Various hospital departments, like the emergency department, intensive care unit, operating theatres, radiology department and the wards at NTFGH were also activated to simulate the activation of the mass casualty decontamination area, treatment area and coordinate the patient surge in an emergency. The Cert volunteers are trained in psychological first aid and crowd management, and were given the opportunity to receive on-the-ground training and see demonstrations by the hospital's medical social workers and security personnel. Dr Amy Khor, Senior Minister of State for Health and the Environment and Water Resources, as well as Madam Rahayu Mahzam, Member of Parliament for Jurong GRC, were also present at the rehearsal. Said Madam Rahayu: "The Jurong GRC Cert team has been working very hard in terms of sharing and training and (Saturday's event) provides a platform for the exercise. "Because if you don't flex your muscles you don't know when you can use it and how you can use it." She added that after the exercise, the team will be looking into ways to effectively activate and deploy volunteers in the event of a real incident. Dr Khor added: "You can never practise enough, you can never be over-prepared and over-exercised in such situations. "This also raises awareness among the community to be prepared and see if we can get more people to come in and volunteer and train to be Cert team members."